Have just got a new LG UHD TV and still on the hunt for 4K UHD content to enjoy on it. The good news is that you can not only stream online 4K movies or TV shows with its built-in 4K movie streaming services like YouTube, Netflix, Amazon Instant Video, etc, but also play local 4K video recorded with 4K device recorders on LG UHD TV, the following article will mainly focus on talking about playing local 4K video on LG Ultra 4K TV from USB or via Plex Media Server. Before going any further, first we should be clear of what 4K file formats can be played on LG 4K TV. From LG UHD TV’s official website, we get the information that LG 4K TV supports to play 4K video with HEVC or VP9 codec with a video frame rate of 60fps. And LG 4K TV compatible audio codec including AC3(Dolby Digital), EAC3, HE-AAC, AAC, MP2, MP3, PCM, DTS, DTS-HD, DTS Express, WMA, RA. It’s likely that the 4K video shot with your 4K device recorders may comes with a format of 4K H.264, 4K MXF, 4K XAVC/XAVC S, 4K Prores, etc, which are not supported by LG 4K TV. 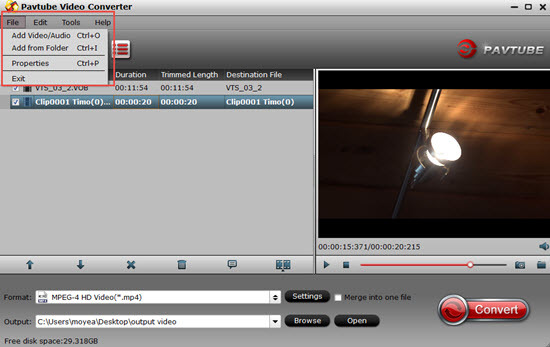 To fix this format incompatible issue, you can download our powerful 4K Video Converter program – Pavtube Video Converter Ultimate to convert all unsupported 4K file formats listed above to LG UHD TV playable H.265 codec with perfect file quality and small file size. For those people who runs a PC with Nvidia Nvidia Graphic Cards that supports Nvidia NVENC technology, you can achieve up to 30x faster H.265 codec encoding speed with our program. You can connect a USB storage device such as a USB flash drive, external hard drive or USB memory card reader to the USB port on your LG 4K TV to access the multimedia files stored on the storage device. Therefore, as long as your LG 4K TV are running with above listed webOS, you can then be able to stream 4K video to it via Plex Media Server without any codec transcoding. How to Convert Unsupported 4K for LG 4K TV Playing from USB or Plex Media Server? Start the program on your computer, click “File” > “Load Video/Audio” or “Load from folder” button to import unsupported 4K video files into the program. Step 2: Output LG UHD TV supported 4K formats. 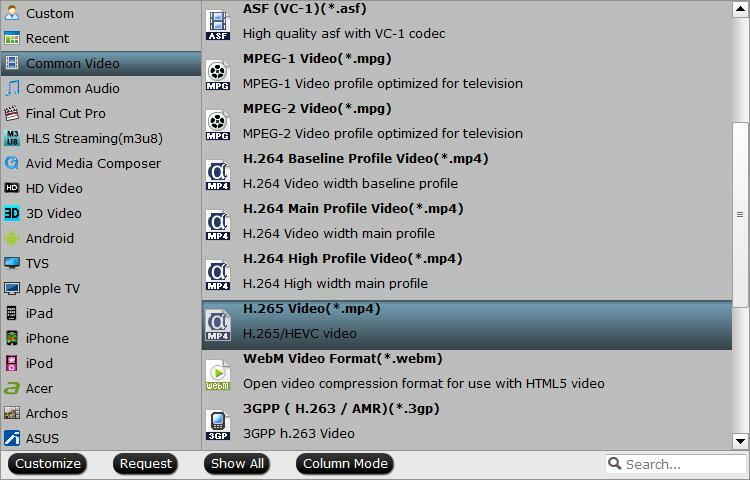 Click “Format” bar, from its drop-down list, select LG 4K TV best playable 4K file formats “H.265 Video(*.mp4)” under “Common Video” main category. 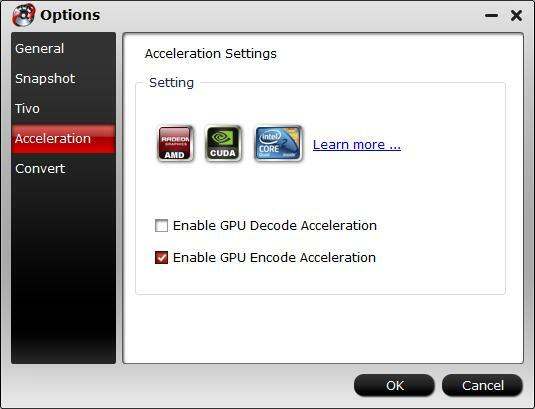 Click “Tools” > “Options”, in the opened “Options” window, click “Acceleration” menu, then check “Enable GPU Encode Acceleration” otpion so that the program will accelerate conversion speed when encoding video to H.264 or H.265/HEVC codec. Tips: Click “Settings” to open “Profile Settings” window, here you can adjust the output audio codec and frame rate to LG 4K TV best compatible audio codec and frame rate listed above. After all setting is completed, hit right-bottom “Convert” button to begin the conversion from 4K video to LG 4K TV playable formats conversion process. When the conversion is completed, click “Open Output Folder” to pop out the folder with converted files, then you will have no problem to play converted 4K files on LG 4K TV from external USB drive or via Plex Media Server. Next → Next post: What video formats TCL TV USB port play?